This is the power, hurtling from space, that could wipe us out like the dinosaurs. Or so they say. It could be a close call, with the potential to collide with Earth. Still, it’s an incredibly minute chance. Asteroids and meteors regularly pass by the planet, and not infrequently there are episodic peltings from space rock that hit random areas across the globe. Sometimes people are killed, and buildings are destroyed. But the next one headed this way will be brushing by pretty closely, and could bring with it the power of billions of atomic bombs, enough reign down destruction across the planet. Experts are saying a huge meteor is rocketing close to Earth with the power of THREE BILLION ATOMIC BOMBS, AHHHHHH. China’s Purple Mountain Laboratory discovered the massive asteroid using Asia’s largest telescope, determining the meteor was passing our planet with a range of 18.8 times the distance between the Earth and the moon — aka, WAY too close for comfort. But scientists are keeping a close eye on 2009ES as just a minor change in its flight path could have catastrophic consequences for the human race, due to its sheer mass. But what about the chances of a truly ‘deep impact’ that could destroy all life on earth? Well, of course, the chances are very, very slim. But how many times can we dodge a bullet simply due to improbability? These things could happen. Let us hope they do not. Both the Pentagon and Russia’s defense have been working on asteroid and meteor destruction system, including plans to shoot down incoming space rocks, as well as a plan to capture asteroids in a giant orbiting catch basket. That, and whatever else they cooked up from late night viewings of Hollywood disaster films. But scientists are actually not just hoping to avert disaster; they have set a goal to capture one, and actually find the devastating prospect of an asteroid headed for earth somewhat attractive. Researchers are strategizing about how to ‘capture’ an asteroid or meteor and force it into orbit – in order to study, explore and exploit it. Naturally, they could then take advantage of any resources it could offer (including near-Earth living space for some future colony project). NASA has proposed the Asteroid Redirect Mission (or Asteroid Initiative), an unmanned robotic mission, to “retrieve” a near-Earth asteroid with a size of about 8.2 metres (27 ft) and a mass of around 500 tons (comparable in mass to the ISS). The asteroid would be moved into a high lunar orbit or orbit around EML2 (halo orbit,Lissajous orbit) for research and exploration purposes. Under consideration for moving the asteroid are grabbing the asteroid and using solarelectric propulsion to “directly” move it, as well as gravity tractor technology. 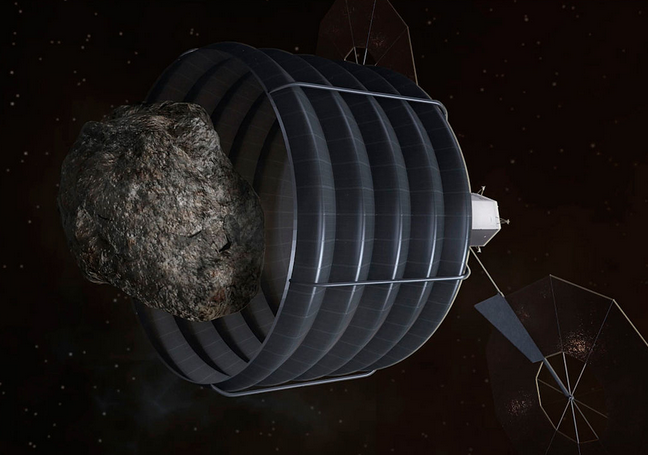 The mission could provide a relatively low-cost route to satisfying Barack Obama‘s goal of sending astronauts to a near-Earth asteroid by 2025, and help develop knowledge and skills useful for future asteroid impact avoidance, in-situ resource utilization (including water for astronauts and for producing fuel, and material for bulk shielding against cosmic rays, for use there or elsewhere in space) and other asteroid mining (as well as providing a first target for the latter two). The whole things seems a bit disaster prone, without much room for error. Nonetheless, perhaps it could shield the planet, and yield some lemonade afterwards, too. Will any of it work? I guess we’ll find out after several billion more in military spending gets sucked into the great black hole of the secret space agenda. Every day above ground is a good one.